Basic Reading Inventory (BRI) is an easy-to-use, individually administered informal reading assessment. This all-in-one package includes all of the tools needed for teachers to assess, interpret, and develop responsive reading instruction for their students. The manual includes all of the information needed for administering, scoring, and interpreting the BRI. A separate student book contains all of the word lists, passages, and early literacy assessments used by students. 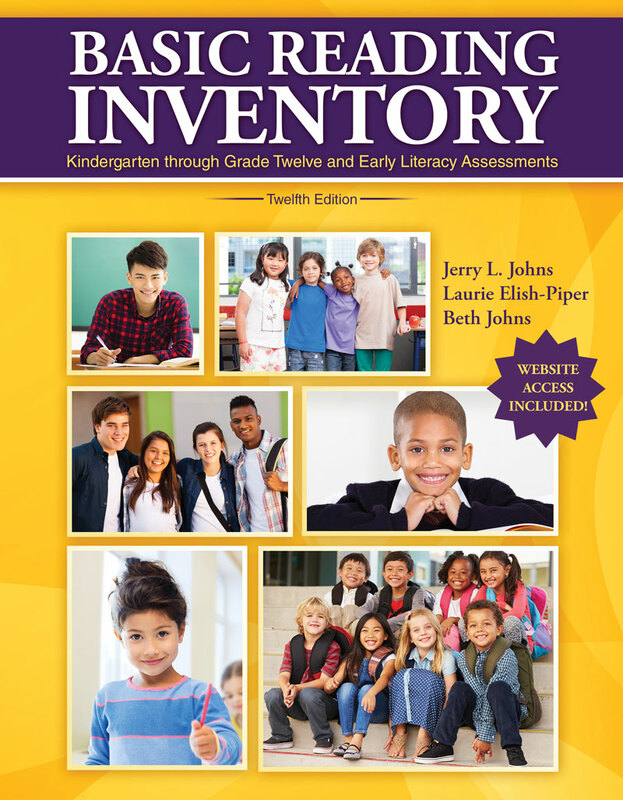 Basic Reading Inventory (BRI), written by Jerry L. Johns, features contributions by Laurie Elish-Piper (Presidential Teaching Professor and Literacy Clinic Director - Northern Illinois University-DeKalb) and Beth Johns (Writer and Editor - Seattle, Washington). Includes graded word lists and passages ranging from beginning reading through grade twelve to assess oral reading. Provides two forms of ten early literacy assessments for students at the beginning stages of reading. Helps assess the five core components of effective reading instruction identified by the National Reading Panel. Multiple forms permit progress monitoring and include literary and informational passages. Grants permission for reproducing student performance booklets and summary sheets for classroom use. Provides strategies for instructional uses of inventory results. Contains an easy-to-use instructional interventions grid to help target student needs. Offers eleven scenarios to help students monitor their reading. Video clips demonstrating the partial administration of the inventory with a student. Performance booklets, summary sheets, and Expert Noticing Observation Guide. Large, annotated bibliography on research and resources related to informal reading inventories. Answers to practice exercises for determining students’ reading levels. Jerry L. Johns, Distinguished Teaching Professor Emeritus at Northern Illinois University, served as president of International Reading Association during 2002-2003. He has been recognized as a distinguished professor, writer, and outstanding teacher educator. He taught students from kindergarten through college and now serves as a consultant and speaker to schools and professional organizations. Jerry is a past president of Illinois Reading Council, College Reading Association, and Northern Illinois Reading Council. He has received recognition for outstanding service to each of these professional organizations and is a member of the Illinois Reading Council Hall of Fame. Jerry has served on numerous committees of the International Reading Association and was a member of the Board of Directors. He has also received the Outstanding Teacher Educator in Reading award from the International Reading Association, the Champion of Children Award from the HOSTS corporation, and the Laureate Award from the College Reading Association (CRA) for significant contributions to CRA and the field of reading and reading instruction. Jerry has been invited to consult, conduct workshops, and make presentations for teachers and professional groups throughout the United States and in seven countries. He has also prepared over twenty books and related resources that have been useful to a diverse group of educators. His Basic Reading Inventory is widely used in undergraduate and graduate classes, as well as by practicing teachers. Jerry recently coauthored the fourth edition of Improving Reading: Strategies and Resources. Other recent titles include the third edition of Fluency: Strategies & Assessments, Comprehension and Vocabulary Strategies for the Elementary Grades, Reading and Learning Strategies: Middle Grades through High School, and Strategies for Content Area Learning, and Visualization: Using Mental Images to Strengthen Comprehension. Laurie Elish-Piper is a Professor of Reading in the Department of Literacy Education at Northern Illinois University. She directs the NIU Literacy Clinic and teaches reading courses for undergraduate, graduate, and doctoral students, including practicums in reading assessment and instruction. Prior to her current position, Dr. Elish-Piper worked as an elementary and middle school teacher and an educational therapist in a clinical setting. She has also developed, implemented, and evaluated family literacy programs for inner-city families and their young children. Dr. Elish-Piper is active in many professional organizations. She is the vice-president of the College Reading Association, an area co-chair for the National Reading Conference, and a member of the Early Literacy Committee of the International Reading Association. She is co-editor of Exploring Adult Literacy and serves on the Editorial Board of The Reading Teacher and several other publications. Dr. Elish-Piper consults with schools and family literacy programs across the Midwest. She also regularly presents at international, national, state, and local professional conferences. Her research, publications, and presentations focus on literacy coaching, family literacy, parent involvement, reading strategy instruction, and literacy teacher education. She has authored or co-authored more than 40 publications including books, chapters, articles, videos, and instructional materials. Beth Johns is a writer and editor who lives in Seattle, Washington. She has grown up with the Basic Reading Inventory, assisting her father (author Dr. Jerry L. Johns) with presentations at Northern Illinois University and the University of Victoria in British Columbia as an example test student. For the last two editions of the Basic Reading Inventory, she has been instrumental in field-testing many new and revised passages. Her contributions for this edition focus primarily on refining and strengthening the materials for grades 3–12, while adding fresh insight to the project as a whole. She is a current member of the International Literacy Association, the Washington Organization for Reading Development, the Seattle Reading Council, and the Seattle Women’s Hockey Club. Jerry Johns' Basic Reading Inventory has been a staple, used in all sections, in both our undergraduate Elementary and Master's of Science in Reading Education programs for many, many years. It offers both the pre-service and in-service teacher very explicit directions for assessing a student's strengths and areas for growth. Each edition includes the suggestions for using the insights that are gained with this instrument. Learning to administer the BRI has been a significant element contributing to the outstanding quality of our programs! I use Basic Reading Inventory for both undergraduate and graduate diagnostic reading courses because it offers a range of forms. It also has explicit directions for administration and interpretation of the assessments, practice scoring scenarios, and questions to aid the understanding of the Basic Reading Inventory. I believe Johns’ Basic Reading Inventory is the most user-friendly IRI on the market. It's layout is exceptional, with comprehensive directions for teacher use. Having multiple passages to choose from also makes it easier to evaluate various reading strategies in oral, silent, and listening reading modes. Directions for miscue analysis and an excellent mix of comprehension questions, including directions for retellings, gives the teacher confidence in both implementation and scoring. Johns' Basic Reading Inventory works well with a variety of graduate students including certified teachers and those in our MAT program. By pairing the Basic Reading Inventory with Johns' Improving Reading: Interventions, Strategies, and Resources, I feel like my students have a solid background in reading assessment and useful resources for their future careers. I use Jerry Johns’ Basic Reading Inventory because I can assess any K-12 student with the many assessments provided. It’s all contained in one book! Jerry Johns’ Basic Reading Inventory is an excellent resource for anyone involved in the teaching of reading: thorough, practical, --a rich resource! I have used Jerry Johns’ Basic Reading Inventory since 2005 in my second and third grade classes and now in an undergraduate reading assessment course that I teach. The inventory always gives an excellent breakdown of where children are struggling in their reading. I love the assessment and use it with all my students from 10 years old to 60 years old. Lynne Zimmer, Learning Solutions, Inc. The Basic Reading Inventory is very comprehensive and provides our Master’s degree candidates with the most complete diagnostic inventory on the market. The teacher candidates who used Johns’ Basic Reading Inventory gave the assessment high marks because it provided valuable information that other district and state tests did not provide. Thank you for making this test available to our students! There are so many aspects of Basic Reading Inventory that it really makes getting a whole picture of a student as a reader just so easy. The word lists, the variety of forms, the expansive range of levels, its organization, and all the supports that Jerry Johns provides. Together with Johns’ Improving Reading, these two manuals make planning instruction as well as interventions for our struggling readers so much more efficient and thoughtful. I love Basic Reading Inventory. It "opened" my eyes and thinking to not just what was "wrong." It led me to discovering the truth and the "what next" my students, teachers, administrators and families need! Basic Reading Inventory is just one of a number of Johns texts that I use as exemplary teaching tools with both undergraduate and graduate education students. Jerry Johns's writing style is so user-friendly with its emphasis on current, best practice literacy instruction in the REAL world of teaching. I have used and taught with one of the competitor's informal inventories, and the BRI is by far the better, more practical tool. I find the Basic Reading Inventory especially effective because of the training DVD and the CD with the printable versions of the protocols. Basic Reading Inventory is easy to administer and score. This places my students' focus on interpreting the results and planning instruction instead of calculating percentages. My pre-service teachers have found the Basic Reading Inventory a great tool to determine what reading comprehension difficulties keep their students from complete understanding of a text. It guides them through each step of the assessment process. I can say without a doubt, the Basic Reading Inventory was one of the best tools in my reading diagnostic tool box. Easy to administer and easy to interpret, the BRI was invaluable in gathering important data regarding my students' reading. I find Basic Reading Inventory to be easy to use and very versatile. I am very pleased that the reading passages address levels pre-primer through grade 12 and that many passages are available at each level, both for oral reading and silent reading. Vacaville Christian Elementary School has used Jerry Johns’ Basic Reading Inventory for the past three years. We have found it very helpful in identifying students with potential learning differences. This tool also, gives our teachers many ways in which to keep track of student progress throughout the year. Jerry Johns’ Basic Reading Inventory is a tool that is easy to understand, takes very little time to administer, and provides many options to choose from depending on need. Basic Reading Inventory has been a resourceful tool for my preservice students. My future educators put theory into practice as they use John's informal measurements to experience how assessment really does drive instruction.